Thanks for visiting the most important page on our site, The Dogs page. Without these guys we would just be a couple of guys and gals walking around in the frigid cold! Here you can take a closer look at each team member and learn a little about each one. We offer sponsorships for each dog on the team and only allow one person to sponsor each team member. We do this because we want each sponsor to feel like they are part of the team. By sponsoring a member of the team you will get personalized updates and you can follow along as we race during the 2018-2019 season. Our older dogs come from some of the top notch kennels in Alaska and our Siberians come from our good friend, April Cox in California. Our dogs are grouped into what we call “Crews.” Each of the crews have a unique story that I am sure you will love. In addition the Nightmare Crew, the 9-11 Crew, and the Oracle Crew and the WaG Crew, are the future of Team Ineka. We hope you will spend a few moments getting to know each of our dogs and follow us as we mush down a dream in the wilds of Alaska! We will be updating this site and our Facebook sites throughout the seasons, Check back for new pics and updates on each dog. Our namesake, Ineka, was a dog we rescued in 2000. He was the most amazing the dog in the world. He could run anywhere in the team and was known as the drill sergeant. He would protect the kids when they were little and running around with juice boxes and sticky fingers and would train the pups when it was time. In 2010 when Robert and Nicole came up to Alaska to check out their new home, Ineka was sick with what we thought was a form of canine dementia. On the day we signed the papers on our new home, Ineka passed away. It was like he was saying, I have done my job now it’s time to do yours. Robert plans on carrying Ineka’s ashes to Nome one day to fulfill his journey. Ineka is was an amazing dog and we think about him every day. With Michele’s love of the beautiful California coast and watching surfers and with Robert’s affliction to skydiving we aptly chose to name our purebred Siberian Huskies after the movie made popular by Patrick Swayze and Keanu Reeves. In the movie, Patrick Swayze’s character is the leader of a group of surfers his name is Bodhi. He leads this group when they aren’t surfing to commit daring bank robberies using masks of the dead presidents. Bodhi (Patrick Swayze) is President Raegan. In July of 2012, Robert and Tyler went down to Kasilof to dip net fish with our friend Dave Scheer. While fishing they caught wind that James Wheeler was looking to downsize his kennel. 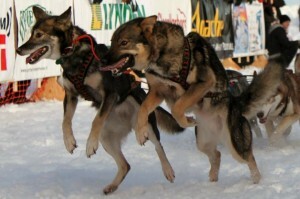 James has some dogs that have bloodlines linked back to Dave’s old iditarod dogs. After much convincing with Michele and Nicole they arrived home with 55 silver salmon and 8 beautiful gray sable huskies. The 9-11 Crew were born on September 11, 2012 and named after the courageous canine heroes that worked during the 9-11-01 disasters. Over the past few years these guys have done some remarkable things. Bretagne, BreBre as we call her, has gone on to become a service dog for a young man that now lives in Texas. She has even saved her handler’s life. BreBre attends school with her handler, Josh and just recently visited Disneyland. The Nightmare Crew are named after the characters from the movie The Nightmare Before Christmas. If you know anything about Team Ineka you know we love scary movies. Over the past few winters the Nightmare Crew has really grown up. 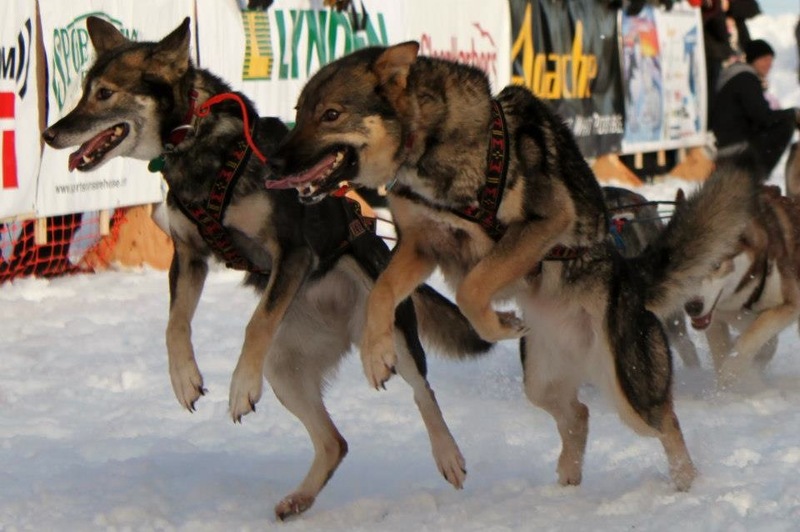 Shock is one of our main leaders and is a veteran of two Junior Iditarods with Nicole and Burton and Barrel are two of the two strongest young talents in the team. Lock can run on any team and any position and has proved she is a valuable member of Team Ineka. The Oracle Crew are all named after characters and things in the movie, The Never-ending Story. This crew of all black dogs is a fierce group. While they are all small they pack a punch. Just recently Atreyu and Bastian showed a lot of promise as the future lead dogs for Team Ineka. These four brothers, Wallace Gromit, Swiss and Skellig are named after the British animation show of Wallace and Gromit. Did you know they love cheese?! Hence The names Swiss and Skellig (a brand sweet white cheddar). These are the veterans. These boys and girls are the heart and soul of Team Ineka and they have travelled thousands of miles with us. The grizzled old man Ringo is enjoying retirement. Frosty is a veteran on Nicole’s Junior Iditarod team. Siblings Aussie and Gabby are some of the best dogs in the team and Rasp is the grandmother to the WaG Crew. All of our dogs stay with us their whole lives. If they are born here we strive to give them the very best care, compassion and love from their first day to the last. If they arrived another way, attempt to give them the best home and training environment where they are allowed to do what the love and are born to do, be sled dogs.